Riding the Ghan Railway – what to really expect! Some of the best, most memorable journeys are those made by train, when you have a chance to relax, slow down, and focus on where you are. When that journey gives you access to remote or hard to get to places, even better. And when the trip can be done in comfort, with excellent food and local wines all included, then it really is win win win. 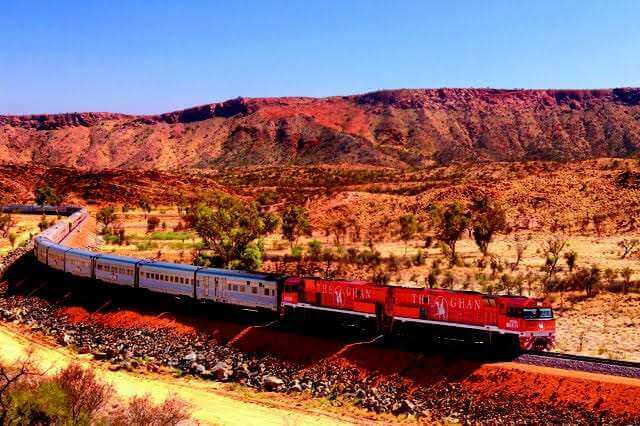 The Ghan Railway, a rail trip of almost 2000 miles running right through the centre of Australia, regularly makes it onto lists of the world’s most iconic rail journeys. Originally named after the Afghan camel drivers who were the first to navigate this route it now offers a far more comfortable way of exploring these dramatic landscapes. The Alice Springs to Darwin leg offers a chance to travel from Australia’s red centre to the tropical northern top end, covering vast swathes of territory in a two day/one night journey. 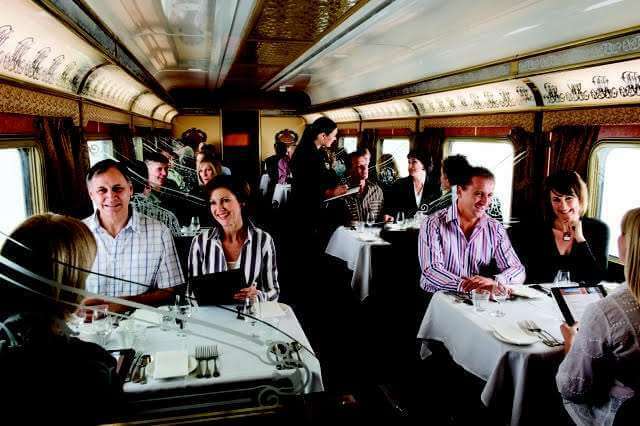 Opting for a Ghan holiday package including the gold service means you can make that trip in style. As soon as you board at Alice Springs, hard choices await you. Do you go to your own private cabin, freshen up in the en-suite, and then lose yourself in the views as the landscape rolls past you? Or do you head through the swaying corridors straight to the Outback Explorer Lounge for all-inclusive drinks and a chance to swap travel stories? Once this conundrum is solved you can look forward to one of the Ghan’s highlights, the included 3-course dinner in the Queen Adelaide restaurant. The chefs here pride themselves on offering a high quality dining experience based on locally sourced produce paired with excellent regional wines. It might be grilled kangaroo fillet, or saltwater barrimundi, or maybe local beef or lamb. Then, as the sun sets you can return to your cabin, now converted into a sleeping berth, and nod off to the sound of the train as it makes it’s way up to Katherine. The Ghan makes scheduled stops at a few key destinations, offering you the chance to explore along the way. So after being gently woken with a cup of your favourite morning beverage, and as large a breakfast as you can handle, there is the chance to stop, get out, and explore Nitmiluk National Park, home to Katherine Gorge. Nitmiluk National Park, in the Northern Territory, is owned by the Jawoyn people, who still live and work there. The area has a rich aboriginal heritage as well as offering stunning views of the gorge created by the Katherine River. With the Ghan holiday package a cruise up the gorge is included. After an initial walk of around 400m over somewhat rocky terrain (make sure you have packed your sturdy walking shoes), the cruise boat awaits. The gorge has been sculpted into the sandstone over millions of years, and now sheer rocks tower 70m above you creating a spectacular vista as you float along. Back on the Ghan it’s time for a two-course lunch and the last leg of the Ghan’s journey to Darwin. You’ve covered over 880 miles, travelled from the heart of Australia’s interior to its wet and wild frontier, had the chance to view it from your own private cabin, and been wined and dined along the way. A truly memorable experience. Maybe there’s time for one more champagne before journey’s end. Images courtesy of Great Southern Rail.